You know you’ve reached middle age when you get excited about a toilet. Although, really, can you name another fixture in your home that you have such an intimate relationship with? In the past six months we’ve purchased two toilets: one for the bathroom in the city apartment and one for the bathroom here at the house. The toilet for the city apartment was a total duress purchase. The toilet that had been installed during the building’s gut rehab in 2006 had been causing trouble for a few years. We really shouldn’t have been surprised when we learned that the cause of a leak into our downstairs neighbor’s bathroom was coming from the toilet. And I guess we weren’t really surprised … but we weren’t really prepared to buy a new toilet either. I wasn’t completely uneducated about toilets, mind you. Over the years I’ve written about toilets here and there. In doing research for those posts I identified three things that I wanted in our new toilet: concealed trap way, easy flushing and comfort height. The thing about a duress purchase is that you have to make your purchase quickly, which means you’re at the mercy of what’s in stock at hardware stores. That basically eliminated the toilets on my Which Throne Will We Own list. 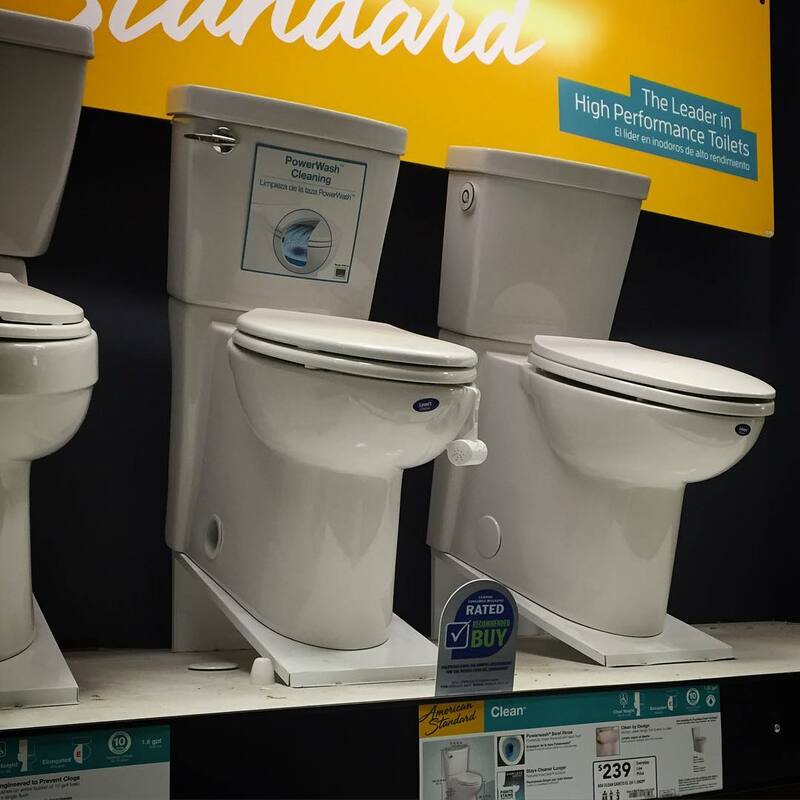 But then in a moment of porcelain serendipity, Lowe’s came through with a toilet that fits all of my criteria – and also happened to be under $300. 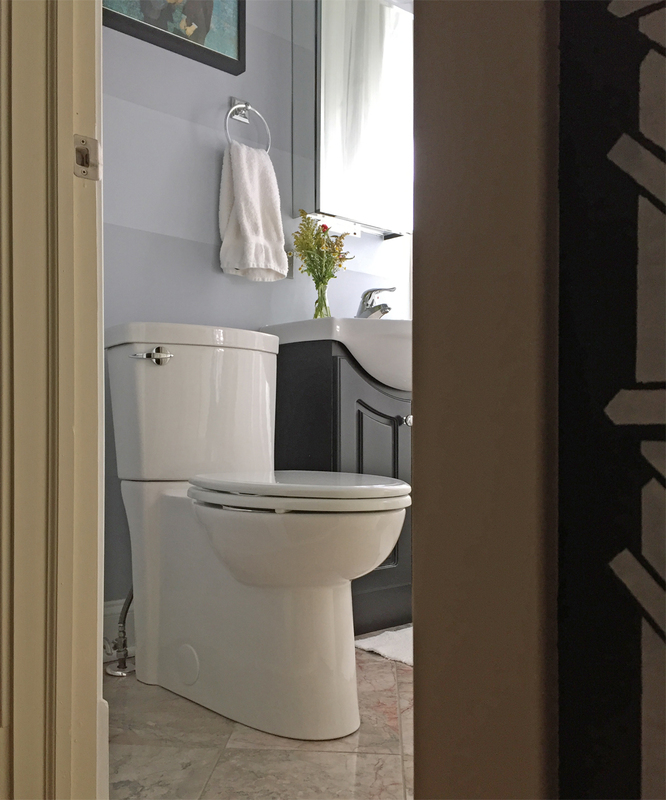 The American Standard “Clean” High Efficiency Elongated Toilet has styling that rivals the more expensive Toto toilets but at a fraction of the cost. As you can see in the photo above that I sent to The Mister when I bought the toilet, the Clean toilet came in well under $300. 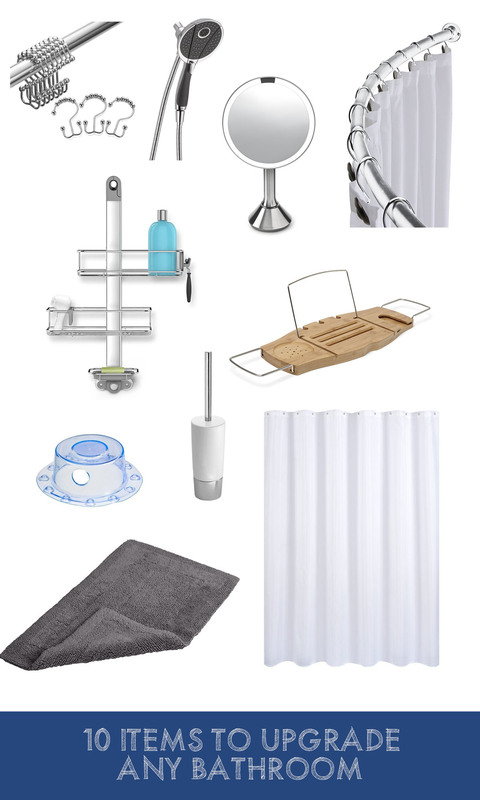 The concealed trapway and small tank look great in our small apartment bathroom. But perhaps even more importantly, this high efficiency toilet (1.28 gpf) packs a powerful flush! My experience with other high efficiency toilets has been that they require multiple flushes – thereby negating any water savings. The American Standard Clean toilet has a strong flushing system that rarely requires a second flush. In fact, we’re so pleased with the toilet that we purchased for the apartment under duress that we bought the same toilet for the house. DISCLOSURE: This is an honest review of our experience with the American Standard Clean Toilet. 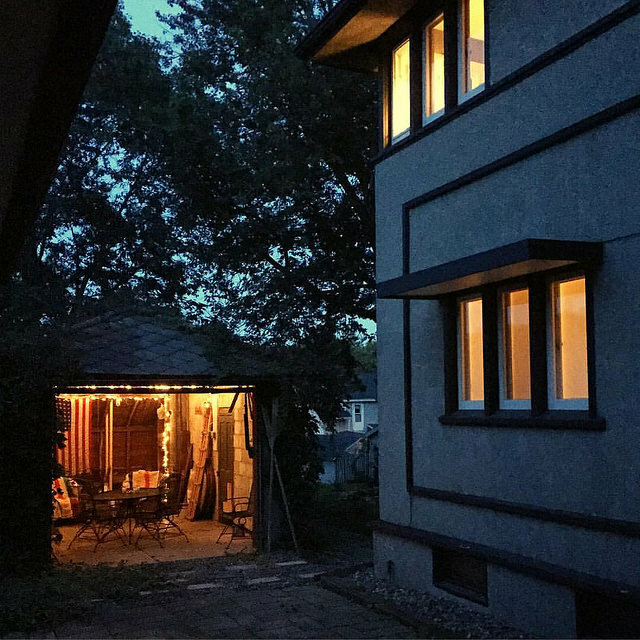 This American House was not compensation for this post. We may receive ad revenue from embedded Amazon clicks. This entry was posted in bathroom, decorating, setting up home on 10/09/2016 by Jason. The Mister and I have been eating off yellow Fiestaware for well over a decade now. When we bought it all those years ago, it was out of a love of kitschy fun colors and Fiesta’s simple design. Now, as we’re outfitting our home with American-made and vintage wares, I’m realizing that our beloved Fiesta is the perfect dinnerware. Home Laughlin, Fiesta’s maker, is based right here in the United States. Fiestaware isn’t for everyone, of course. 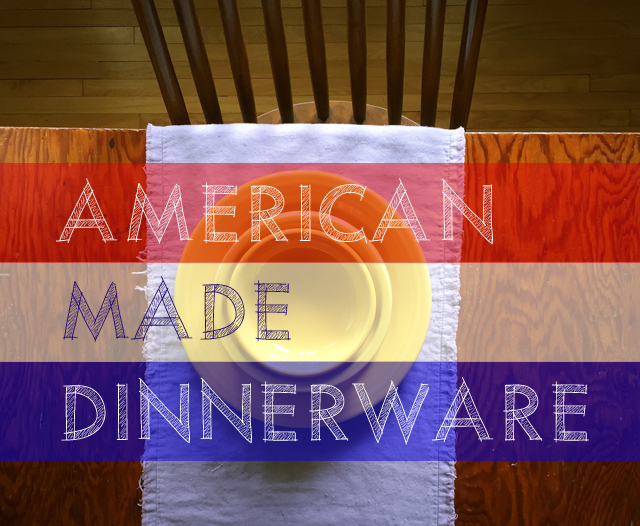 Fortunately, Homer Laughlin has company in the American-made dinnerware category. Check out the full list and add any I may have missed in the comments. Home Laughlin China Company has been making Fiestaware in West Virginia since 1936. In addition to offering tours, folks makes the pilgrimage to their Newell, West Virginia factory of their big tent sale and outlet store. Anchor Hocking products are manufactured in Lancaster, Ohio and Monaca, Pennsylvania. 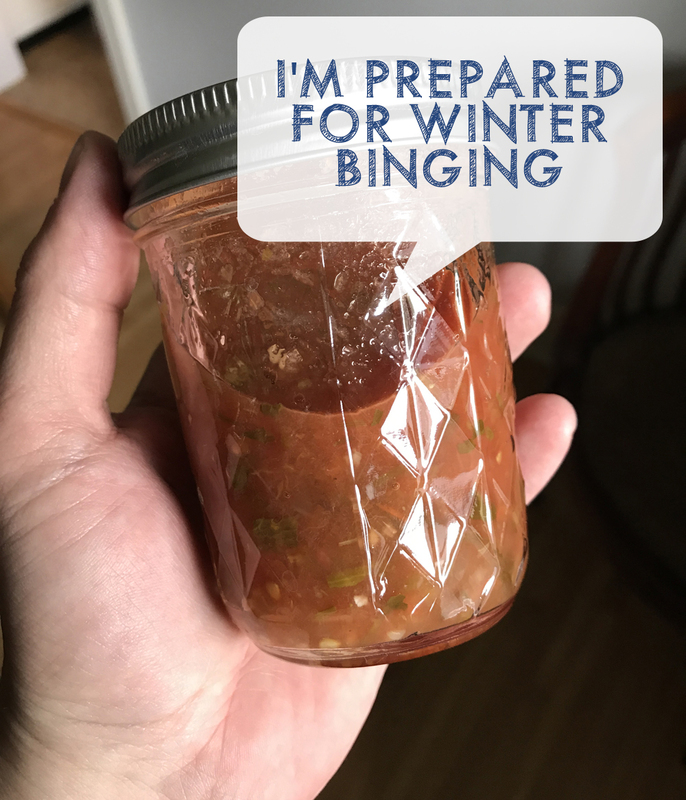 You may associate them most with bake and prep pieces, but they also make a line of dinnerware. Pickard China has been manufactured in Antioch, Illinois since the 1930s. Known for making the official White House china service, Pickard is American’s oldest fine china manufacturer. HF Coors’ dinnerware is produced in Tuscon, Arizona. From the simple American White and American Bistro lines to the Frank Lloyd Wright dinnerware, HF Coors has a nice selection of tabletop goods. Lenox also has a wide selection of American made dinnerware, with designs from Kate Spade, holiday patterns and many other options. Bennington Potters produces beautiful stoneware in Vermont. Started in 1948 by David Gil, Bennington makes stoneware pottery intended for everyday use. In addition to dinnerware, they also produce bakeware and serving pieces. Emerson Creek manufactures ceramic dinnerware, as well as a full range of pottery, in the Blue Ridge Mountains of Virginia. Simon Pearce glassware and dinnerware are handmade in the United States. Their operations in Vermont are hydro-powered and include a mill and restaurant overlooking the falls. 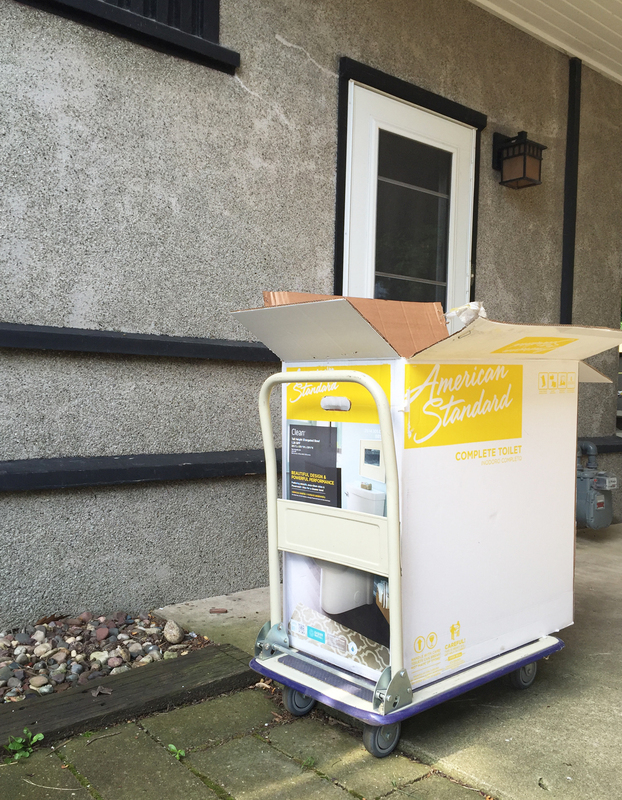 This entry was posted in American made, furnishing, setting up home on 05/18/2015 by Jason.